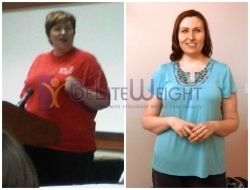 Kiely has lost 107 pounds after her Gastric Sleeve Surgery eighteen months ago*. Recently, she accompanied her friend to the Hospital in Tijuana, Mexico for her own surgery. Kiely gave us a video update on her progress. She had her weight loss surgery at the Star Medica Hospital in Juarez, Mexico with Dr. Jose Rodriguez Villarreal & Dr. Elmo Aramburo so she also gave her impressions of both hospitals. Thank you Kiely, please keep in touch!